Are you contemplating divorce? Do you have children? If you are in a relationship/marriage, with children, that’s not working, consider coming apart together. You created your children with love, hopes and dreams for a family future. Just because the adults can’t be together, don’t deny your children the feeling of a family. When there is a divorce battle, there are two distinct sides, often dividing extended family and friends. Everything trickles down from parents. When there is a divorce war, children (and others) feel the need to take a side. Everyone loses. Children lose the continuity of co-parenting and perhaps parts of each extended family. War is trauma… divorce war is a more personal trauma. The alternative is to demonstrate that, although the adults can’t live together any more, they can still cooperate on parenting the people they love most in the world…their children. Children need to be able to love and be with both parents, know that their parents will meet their important needs and will share some parental expectations and consequences so they can enjoy a healthy relationship with each parent. Cooperative co-parenting is a valuable role model. For parents who do need to come apart, a worthy process is the collaborative divorce method. It’s private, out of court, with a team approach. Divorce specialists – attorneys, financial and mental health professionals, with specific expertise in the different aspects of divorce, work together. 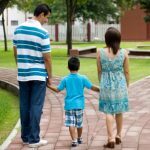 They provide a comprehensive approach to resolve differences and set the family on the road to still being a family, in two homes. Two homes can provide love, guidance and the opportunity to see that differences can be settled when people listen to each other, respect the other and come up with solutions that are best for their children. If this sounds familiar, please consider the collaborative way.